Look at the bottom of the page for more infos about this map. A new quiz is out, don't cheat!!!! The following interview was held between me and Simon Powell alias Digger. I already introduced some of his works over HERE, but now you will get a better insight in what he does. "Tell us a little bit about you and your RPG background, especially about your relation to Earthdawn." "I’m 44 and live in Newport, Wales, U.K. I had to retire from work about 3 years ago due to ill health. I’ve been role playing for 22 years; I started with Warhammer Fantasy. I first started playing GM’ing Earthdawn about 9 years ago with a group in Newport. When we play we never stick strictly with the rules as we consider ourselves Roleplayers not Ruleplayers. We had a short break of about 2 years when material dried up where we played Everquest Roleplay. We started back up again when Redbrick took over. I’ve always tried to contribute in some form or another as I feel strongly that GM and Player input helps keep games alive. I haven’t run a game since autumn of last year as my health hasn’t been good. I was working with a project to convert some of the German fan books to English but that seems to have come to a halt. One of the things I love about Earthdawn is that it is based in the world we live in and has a rich storyline. I love trying to relate things that happen to the real world." "You did those topographical maps, what gave you that idea making those maps?" "I started out making floor plans with a piece of software called Dundjinni, (I contribute items to their forum for people to use in creating their own maps), trying to map out locations from different sourcebooks. After reading on a forum that the Earthdawn maps did not fit the maps of current Earth, I took that as a challenge and tried to prove that they do. I looked for a good topographical map to use for about 6 months and then by accident, discovered that the Microsoft Encarta I bought my kids had the perfect map base to work with. I emailed Microsoft and they gave me permission to use their maps as my base on a non commercial basis. I compared the areas on my real Earth maps and then added in the locations and some details such as woods. I think I managed to prove that Earthdawn does fit. I would like to eventually turn them into a free downloadable pdf." "When and how did you start to make digital art? Which programs do you use and which can you recommend?" "I got interested in the digital art side of things at Xmas of last year (2007). I love trying to represent the world we play in as realistically as possible. Unfortunately as Redbrick like the more traditional drawing format for Earthdawn that lets me out of images for the books. Some of my images are being used for the Fading Suns line, there are two of my images in Ruinous Folly, and there are more in the pipeline. It’s possible you may see some of my work in Blue Planet too. I use Hexagon for creating some of the objects, Poser figures for people and animals and Vue for rendering." "Some of your latest works are airships, what inspired you to make them? Will there be more?" 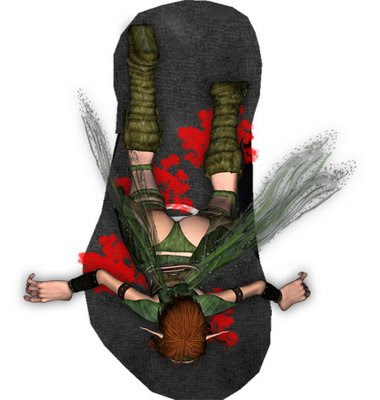 "I have been creating models of some Earthdawn items for a while now but had not displayed them as EDPT was offline. As a few people were talking about airships I decided to display mine. I do hope to produce a few more scenes of different locations and object when I can. I am still learning how to use the software, so am limited in some ways as to the images I can produce." "What future projects do you have in mind, what can we expect?" "I am currently working on items for Fading Suns and Blue Planet, and hope to do some more mapping of the Earthdawn World. 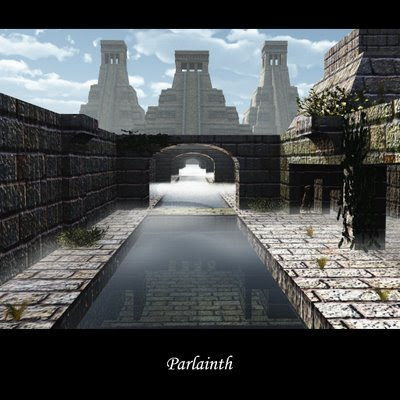 I am also working on ways to bring some of the cities to life, the Parlainth image I did is one example. On my drawing board at the moment is Haven." "All I really am is a fan trying to make sure that the system I really like stays alive and doesn’t disappear like so many others. I would encourage everyone who loves Earthdawn to get involved, it’s the Fans that keep a system alive." Several digital works from Digger that are not Earthdawn related but worth a closer look, can be found over HERE. He was also so kind to let us have a look at his current works, CLICK & CLICK. The following interview was held between me and Hank Woon (thanks to Dammi), author of the upcoming Earthdawn Novel "Dark Shadows of Yesterday". Would you short introduce yourself? You bet! My name is Hank Woon, and who I am and what my relationship is with Redbrick Limited can be found on their website. When and how did you come to write "Dark Shadows of Yesterday?" Throughout the Cathay sourcebook, there are many legendary stories, though many are brief and simple allusions to heroes and villains past (especially in the new magical items chapter). Most such entries demand a succinct description, but I found that even when I was finished with them the stories continued on in my mind. Likewise, throughout the sourcebook there are hints of the many adventures that Daylen Jagaro went through while exploring Cathay, and though only small slices of his experiences make it into the sourcebook, I tried to envision his epic journey in detail. At first, this more in-depth, behind-the-scenes back story was merely to add weight, flavor, and consistency to the sourcebook, but as time went on, Daylen’s many trials became more and more interesting to me. Then last December, my hometown was blasted by a powerful storm with winds equivalent to a Level Three hurricane, and I found myself without electricity for eight days. 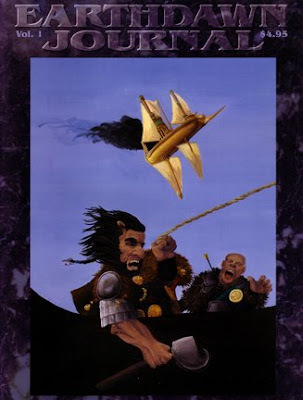 During that time I read five novels that I had been putting off, which really put me in that frame of mind, and one of them was Shroud of Madness, an Earthdawn novel by Carl Sargent & Marc Gascoigne. 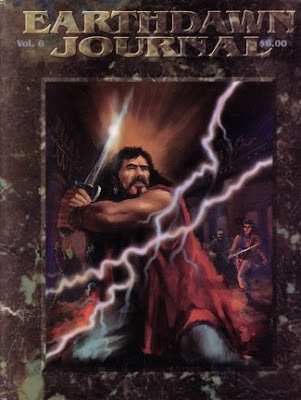 Since it was an Earthdawn novel, I found that while reading it my mind kept wandering back to Daylen, and without any effort of my own, many of these back story ideas I had for the sourcebook began coalescing. A short time after I regained power, I jotted down a framework, and a couple days after Christmas I started writing. What's the actual state of the novel? I finished the novel 58 days after starting. The draft was already finished before I began, in my mind at least, so all I had to do was get it out of me and into print (it also helped that while writing it I was taking 2 literature classes at Washington State University, so I had all of these inspiring novels to draw from). After I turned it in, the talented team of editors at Redbrick read it—sometimes more than once—and offered their criticisms, then revisions ensued, and then it went into layout. I’m actually working on the sequel right now. I had no intention of writing a sequel, but just like the first, ideas kept coming, and the story fell into place too perfectly not to tell. So last week I started writing, and I’m about 20,000 words in so far. I know that it’s hard to tell us a release date, but approximately when could it come out? Hm…well, it could come out very soon. Redbrick doesn’t like to set dates, because that could lead to disappointment if something changes, but the novel is all done, there is an awesome cover done by the mega-talented Kathy Schad (see preview), and it’s just basically awaiting approval from the fine folks at FASA. You already offered a small piece of information about the content in the interview about the Cathay sourcebook. It will be about the merchant Daylen Jagaro. What else can you tell us about the book? Thank you very much and good luck with the novel, I can't wait to read it. You’re welcome, and thanks for the interest. I hope you enjoy it! It startet in 1994, when the first volume of the Journal came out. 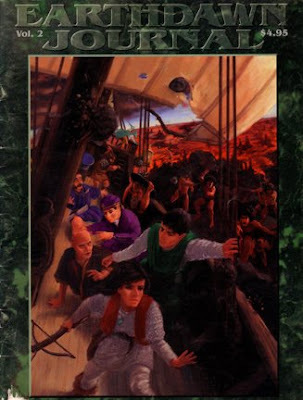 Until 1997 nine editions were published by Sword of the Knight Publications. 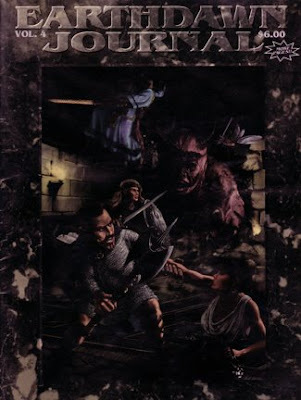 Then the whole project went down and today the original magazines are a unique treasure for real Earthdawn fans. If you want to know what those Journals were about, you can watch the content online at the "Archives of the Great Library" of the Earthdawn Journal webpage. 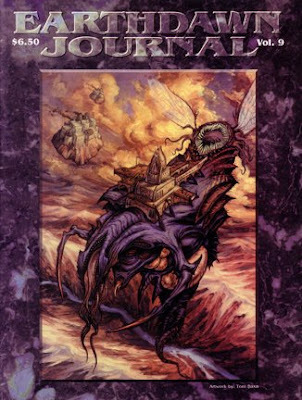 So why do I mention the Earthdawn Journal when a lot of you (Earthdawniacs) already know about it? Because the situation today is different. Such a nice magazine, that contained a lot of different articles about several topics like legends, towns/villages and magical items, doesn't exist anymore. Although the Earthdawn Shards from Red Brick are quite similar, they contain solely adventures. Without the fanprojects like the "Book of Tomorrow" or the german "Foliant des Abenteurers" a huge gap wouldn't be filled with small stories and add-ons, like new spells and discriptions of various places. But also the fanprojects can't provide what the Earthdawn Journal did: a constant publishing of, for example 9 issues in 3 years. I don't want to degrade the work of the fans, I just want to explain what made the Earthdawn Journal so unique. For me it were the widespread themes included in one mag and the regular release, that make the Journals even today very useful. Hopefully there will rise another new fan project, that dedicates its works to the Journal and follows again its concept. I found some useful person indexes on a German page called Die Schwarze Schar. Those indexes were made by an unknown author (if the original author reads this, leave a comment) and were completed by Martin Steger from "Die Schwarze Schar". First is a person index of Barsaive (mirror), it contains a collection of all persons mentioned in several sourcebooks from FASA. Most names are from the english originals, but some names are the german translations. Second is a person index of the Theran sourcebook, completely in english. Red Brick (founded in 2003) started to publish in 2004/2005. 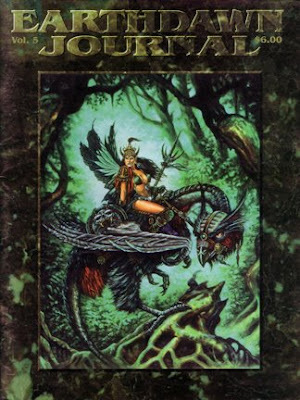 But also the other companies had to find a new line after FASA stopped publishing Earthdawn in 1999. Games-In-Vlg. for example, was allowed to use and publish the Fanpro (former german publisher of the translated FASA books) material. 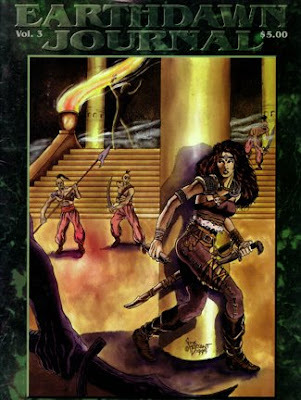 When Red Brick began publishing, they owned the licence to sell the old FASA books, Living Room Games on the other hand, wasn’t allowed to publish the old Earthdawn Stuff from FASA, so they had to make the „Second Edition“. But today 9 years after FASA closing its doors, we can look back to see what those three companies did, to satisfy us. So I decided to offer you an overview how much books were published in which year and by whom. What? Confused? So here is an overview about the material, that has been published. Ah, some Games-in-Vlg. books are marked with *, which means that those books have been made by Games-in, the rest of the books already existed from the Fanpro era, so these books without * are a republication by Games-In. 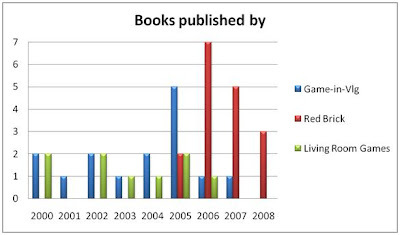 Altogether Red Brick published 17 „books“ (several are Shards and not comparable with sourcebooks) in 4 years, Games-In-Vlg. „made“ 15 books and finally Living Room Games was able to publish 9 books on their own, after FASA‘s and Fanpro‘s retirement. lot of stuff. Connected through forums, webpages and mailinglists, some really impressive books appeared for free on the internet. I put some of those additional Earthdawn books together into an extra sheet. Unfortunately is EDPT offline at the moment (yes, I just linked an unavailable page), where most of the English material was provided. 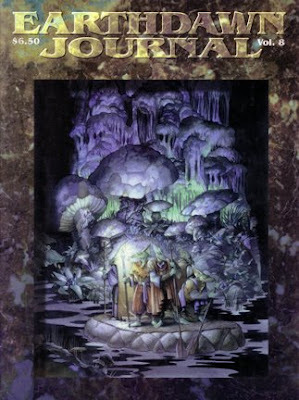 Of course there has been published a lot more material, like the Earthdawn Journal from Sword of the Knight publications (which closed in 1998), but I just wanted to offer an overview since FASA's closing and not a complete product list of everything that has ever been published. But if you find any faults, feel free to leave a comment and correct me. 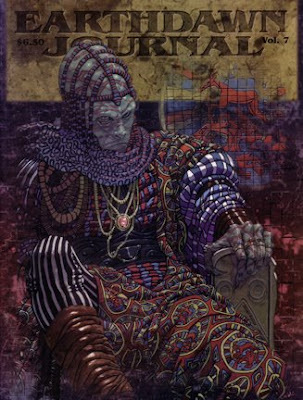 In Earthdawn exist two different kinds of calendars, the Theran and the Throalic calendar. The Throalic calendar is divided into 12 month with 30 days each. 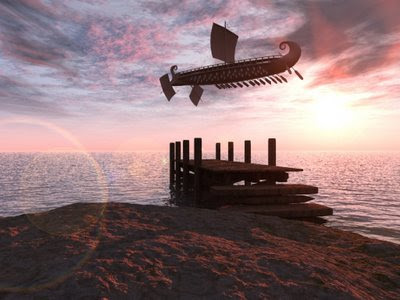 The months of the Throalic calendar are: Strassa, Veltom, Charassa, Rua, Mawag, Gahmil, Raquas, Sollus, Riag, Teayu, Borrum and Doddul. On the opposite the Theran calendar has no months, they simply have numbers for their weeks, which include 5 days. In both calendars exist no weekdays. Several calendars have been made by Fans. I also made a Throalic calendar and a Theran calendar, if you should ever travel through other Theran provinces. Additionally I added the link to Red Brick's EPC appendices, wherein you'll also find a throalic calendar made by Red Brick. The following interview was held between me, Carsten Damm and Hank Woon, regarding the upcoming Earthdawn sourcebook Cathay: The Five Kingdoms. Is there a cover preview? Carsten Damm: Sure thing, have a look. The cover is being done by Paul Tobin, who also created the cover for the Name-giver’s Compendium. It’s an early draft, of course, and not yet finished—proper coloration and detail are yet missing. Tell us about the Five Kingdoms--what are these? Hank Woon: The shining empire of Cathay has fallen on dark times. Shortly after the Scourge, the imperial dynasty that ruled over the land for countless generations ended abruptly and without an heir. Dictated by ancient custom and tradition, the Five Guardians of Cathay—great dragons of incredible power—seized the Five Symbols of Imperial Power and set out across the land in search for a new ruler. Each found a champion and bestowed upon him or her one of the symbols along with the words, “One must rule.” The five kingdoms were born, and the empire has been locked in civil war ever since, with none of the kingdoms so far able to gain an advantage in this, one of the bloodiest conflicts the Earthdawn world has ever seen. Will there be new Name-giver races? If yes, mind to tell us about them? Hank Woon: Yes, there will be four new playable Name-giver races (and one familiar Name-giver race will be unavailable in Cathay). 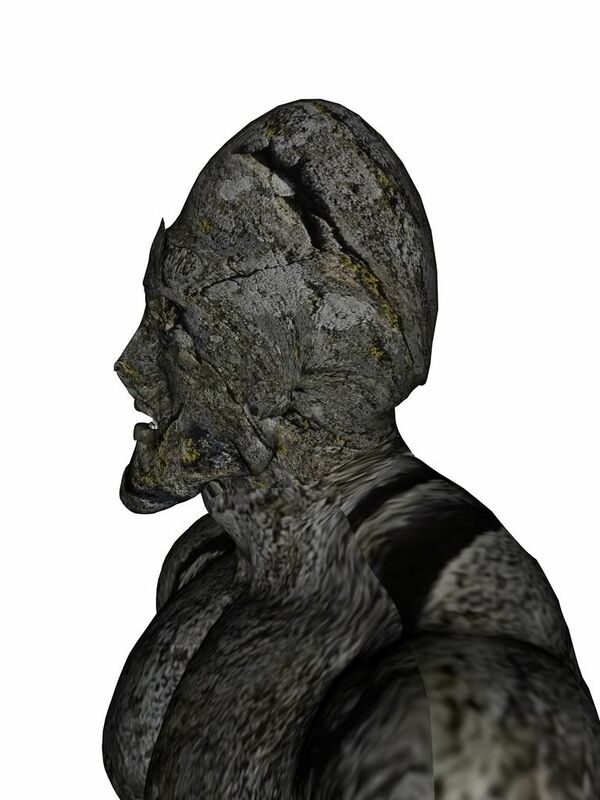 The new races are the ki mao, a xenophobic race of elves whose bodies are striped with the markings of a tiger and whose eyes resemble those of a cat’s; the po na, a race of monkey-like humanoids, driven by curiosity and with a love of practical jokes, and who are the traditional enemy of the ki mao; the gar, a race of savage warrior-elves who, long ago banished to the harsh northern steppes to a certain doom, have not only survived but have become a great threat to the Five Kingdoms; and finally the storm children: sometimes, during the most violent thunderstorms, lightning kisses the ground and leaves behind a fully grown Name-giver who resembles a human, but whose solid-white eyes give away their true nature as storm children. Born with essential knowledge for survival, storm children are driven with an insatiable need to explore and learn as much as they can. Over time, they can even unlock their innate powers, which mimic those of the tempest. Will there be new Disciplines? If yes, mind to tell us about them? Hank Woon: There will be eleven new Disciplines for Cathay. 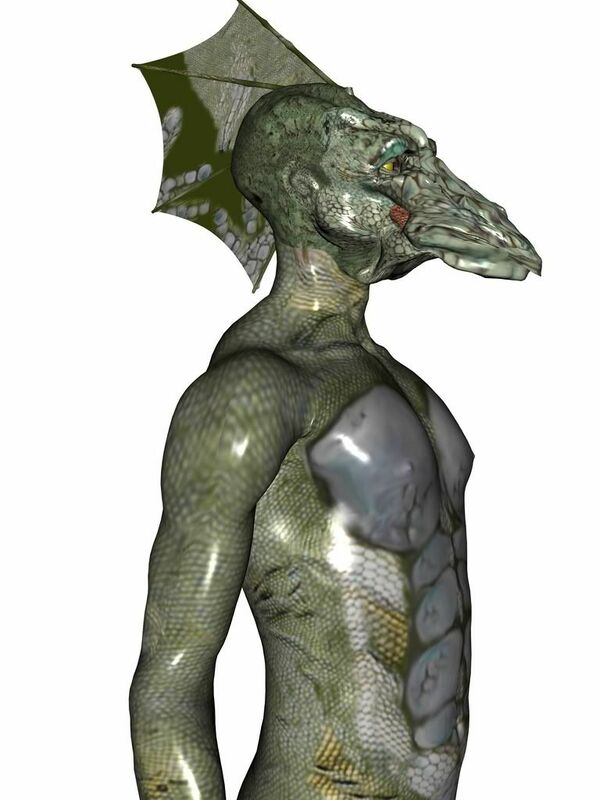 They are the Beastlord, an adept who can awaken the animal spirits from his past lives within himself and manifest these powers through talents, abilities, and summoned creatures; the Daughter of Heaven, an adept who dedicates her life to protecting and healing those innocent souls who are caught in the middle of the violent conflicts that ravage the once mighty empire; the Gar Warrior, a nomadic raider who is part Archer, Cavalryman, and Warrior; the Guardian of Cathay, elite adepts whose noble order has protected the interests of the empire since its founding, but now, like the empire it was created to defend, has split into five distinct factions; the Merchant, entrepreneurs who have taken advantage of the war to seize a profit; the Monk, adepts who seclude themselves from civilization to dedicate themselves to Lung Do, or The Way of the Dragon; the Pugilist, an exhibitionist fighter who uses his fists to pummel his opponent into submission; the Samurai, an elite warrior caste found in the neighboring island nation of Jih’Po; the Scholar, adepts who, trained out of Cathay’s fabled Tower of Secrets, search the lands for knowledge, both magical and mundane, for the interests of the empire; the Sorcerer, a magician whose transformation spells make them feared throughout the land; and finally the Sword Dancer, Cathay’s exotic adepts whose martial dances tell the legends and stories of heroes past, carving the legends of tomorrow with steel and blood. Each new discipline has new Talents, new Talent Knacks, and new fiction, similar to the entries found in the Earthdawn Player’s Compendium and Name-giver’s Compendium that explains their unique philosophical outlooks. Is Cathay a Theran province? What about the relations between Barsaive and Cathay? 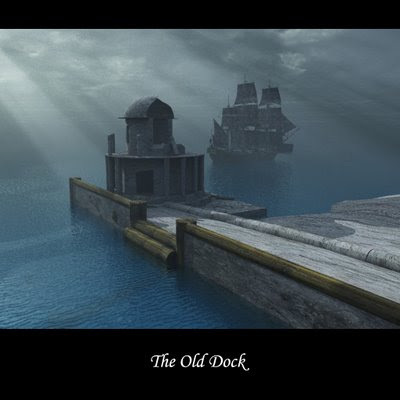 We know Urupa is the only port for folks from the East, so how come there is a connection now? Hank Woon: While there have always been the occasional western smuggler, Cathay long ago sealed its borders to the West. However, the civil war has finally forced the Five Kingdoms to redact their official isolationist policies in order to secure the resources they need to continue their bloody conflict. 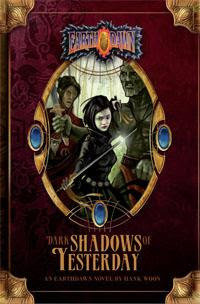 Barsaive has only recently made contact with Cathay, pioneered by the human merchant of Bartertown, Daylen Jagaro (fictional writer of the sourcebook and protagonist of the upcoming Earthdawn novel: Dark Shadows of Yesterday). About Cathay in general—what can we expect? Hank Woon: You can expect it to be very Earthdawnish. While some have voiced their concerns about Cathay being nothing more than another “Ancient China” setting, unless you feel that Barsaive is “just another” Medieval Europe or Renaissance-type fantasy setting, we can assure you that it is anything but. You can expect several new magical items, a new Goods and Services chapter that details dozens and dozens of new Cathayan weapons, armor, and items, a Bestiary chapter with over 60 new creatures, Horrors, Named Horrors, Horror constructs, and unique dragon entries, new spells for both the new Sorcerer discipline and the familiar magician disciplines, new Secret Societies, and a whole lot more. What will the approximate pagecount and price be? Carsten Damm: We think that the Cathay book will be about the same size as the Name-giver’s Compendium and Nations of Barsaive, Volume One. Can’t say for certain at this point, as the book is still in development. Carsten Damm: We don’t have deadlines and don’t announce release dates. 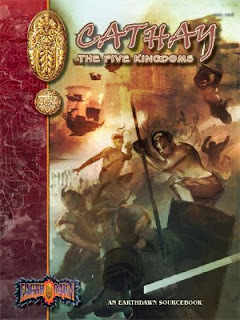 Cathay: The Five Kingdoms is scheduled to be released after Kratas: The City of Thieves, but things might take a bit longer as it consists of all-new material and needs an entire set of new artwork. There’s a Cathay novel coming out (Dark Shadows of Yesterday, mentioned above), and you might even see Nations of Barsaive, Volume Two earlier than Cathay in case we need more time to get it right. It's a completely new Earthdawn book. Was it harder to write and develop it? What problems did you encounter? Hank Woon: There have been no real problems with the creation of this sourcebook other than the time it takes to ensure a solid product. There are a lot of new talents, talent knacks, spells, magical items, creatures (with new powers), and so forth, all of which must pass through the gauntlet of editors for quality and balance. Special care was taken to not create anything that is redundant—or that overshadows—existing material. We also had to make sure that the sourcebook will be useful for those gamemasters who don’t intend on taking their players to the East, which is why there are plenty of new Disciplines, spells, magical items, and creatures that gamemasters can use to bring new life to Barsaive. Likewise, we wanted to make sure that each of the new Disciplines have plenty of inherent reasons for adventuring, so as to take the burden off of gamemasters, making it easier for them to rationalize their involvement in whatever epic tale in which they will be swept up. Finally, share some personal comments about the book and the work on it! Hank Woon: When Cassy Petrich, Craig Guarisco, and I wrote the original draft of this sourcebook three years ago, we were very mindful about one thing in particular: conflict. Conflict drives drama, whether it be man vs. man, man vs. beast, man vs. self, and so on, and all can be found in the pages of this sourcebook. It was our goal to seed Cathay: The Five Kingdoms with inspiration on every page, from the seemingly trivial fluff to the game mechanics. It was our hope to not only create an exciting and richly detailed setting, but a sourcebook that gamemasters might be able to flip open, read a paragraph or two, and be inspired for that evening’s session. The editing and development team at Redbrick is currently busy ensuring that our original goal will become a reality, while at the same time, being careful to make certain the sourcebook rings true with the existing Earthdawn products we all know and love, both structurally and thematically (hence why we resisted the use of overly flowery names when a simple one would do: in Earthdawn, a thief is just a Thief, a warrior just a Warrior, so too is a monk just a Monk and a samurai just a Samurai). I want to thank Carsten Damm and Hank Woon for the interview.